There is incredible potential within a seed, however without it being planted, nurtured and pruned, it will never grow into its full potential. There is an old saying that as parents we provide our children two things; Roots and Wings! In the same way as educators and community leaders we want to unlock the potential of every student and give them the values and means for a brighter future. We believe equipping them with the necessary tools would empower them to inspire and impact their own generation for the greater good. In 2006 Tony was compelled to share his story in hopes to inspire youths off the path of destruction he was once on. So impacting was his story that a multimedia drama production was scripted by students and performed by volunteers across Australia with outstanding outcomes. 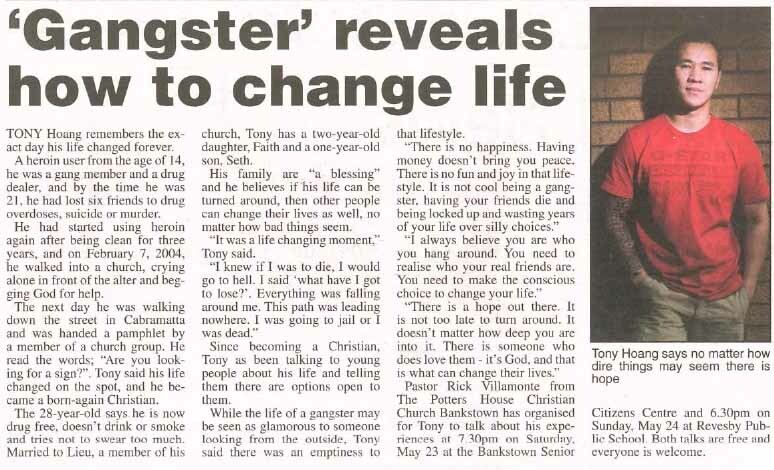 In 2008 his story caught the attention of two Australian national television programs, Channel 7’s “Gangs of Oz” and SBS “Once Upon a Time in Cabramatta”, Tony has also been featured in books, over 30 news articles and interviewed on some of the top rated radio stations across Australia and New Zealand. Looking forward to see how we can help make a difference.